Ah the age old story of trying to be fit, have a social life, save money, sleep, work and have a relationship all the time within 24 hours each day. It's hard isn't it! I would always laugh at the memes in college that said "pick two: sleeping, good grades, social life" -- because it was so true! To say that I have a lot on my plate would be an understatement: a full time job, a blog, planning a wedding, a social life, working out, and maintaining a healthy and loving relationship with Andrew and my family. It's exhausting to just write out! But you just find time, right? Over the past year I've really made a conscious effort to workout and live a healthier lifestyle. And if I can do it, anyone can! So I wanted to share some tips (serious and fun!) to help you guys do the same. Tip #1: Go before work -- When Andrew and I were doing BBG we would wake up early and get it done before work. It's not for the faint of heart (working out before work or BBG) but it was SO nice to not have to worry about it after a long day at work. To just come home and relax without the added stress was so ideal. Tip #2: Go after work -- If you've just skipped ahead because you said heck no to tip #1, try working out after work. Find a place that is either near your job or near your house or even by where you run errands (two birds). Having a place that is easily accessible really helps hold you accountable. No one is trying to drive an hour to get to a workout class. Tip #3: Use Febreze Fabric Refresher Post-Workout -- Um talk about a game changer. I don't know about you but I SWEAT during class and it can get pretty stinky. But with my busy schedule the last thing I am able to do is go home and wash my clothes. 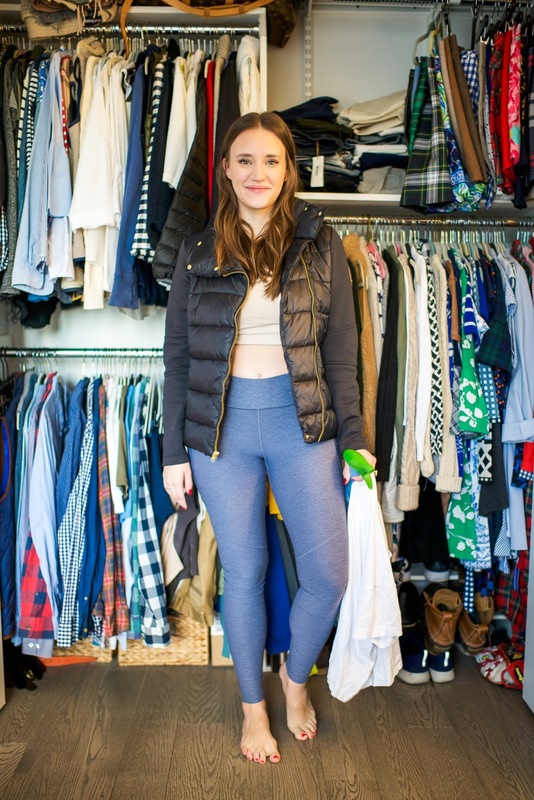 I usually run errands (I am one of the 84% of gym-goers* who admit to running errands two hours after working out in their workout clothes! ), go to dinner, you name it -- and the last thing I need is for the odor to come with me. This is especially true if I work out before work and have to carry my gym clothes with me. I usually carry everything in one bag for the day and we don't want any of that to travel -- its time to leave the gym smells stay where they belong (at the gym!) 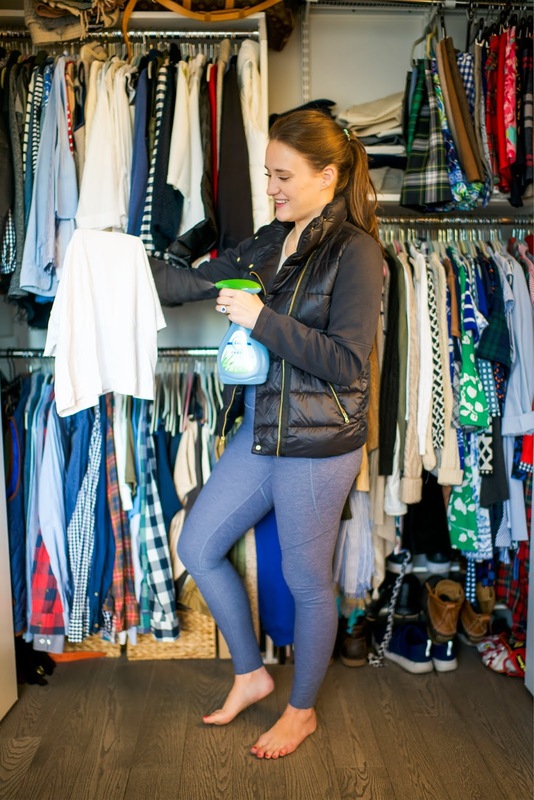 Post-workout, simply spray Febreze Fabric Refresher on your gym clothing, sneakers and gear until completely damp to safely and effectively clean away workout odors. Febreze Fabric Refresher with OdorClear Technology cleans away odors by seeking out tough odors and cleaning them away by deactivating and replacing them with a light, fresh scent. Tip #4: Go with friends/have an accountability partner -- The major thing for my workout revamp has been having a person to go with. BBG was with Andrew and he held me so accountable and more recently I go with girlfriends (hello, socializing AND working out!) and it makes the whole process a lot more fun. Bonus points it's usually with girls from work so we just leave together and head on over (to a class that is near by, really checking off all the boxes here). Tip #5: Find something you love to do -- I think this was a big key with BBG -- I loved it and then I really started to hate it. I would resent and dread going and so I stopped. Now I absolutely love the classes I'm taking and have so much fun and feel so much better after I'm actually sad when I can't make a class. Barre3: I am still on the Barre3 bandwagon and we are rolling at full speed. I love the workout I get during a class and just how good I feel after. I feel like I really worked hard, I feel happier and I feel ready to take on whatever is next. It is 100% my favorite way to workout. Y7 (hot yoga): My girlfriend from work turned me on to this and I love it. It's HOT yoga and I never sweat as much as I do during this class. It's so bad you don't even bother wearing a shirt and you come out just dripping in sweat (hello smelly Krista). It's a little different than traditional yoga because they play hip hop music during the class and it's pretty dark and a little bit quicker than normal. But it's just so good! It gives me time to clear my mind and to feel more relaxed but also to sweat out a ton of toxins and push my body in a different way! 305: I'm actually really happy to announce that I'm a 305 brand ambassador! For those who don't know 305 is basically a Miami club turned workout dance class. You are non stop jumping around and moving and dancing (and sweating) for a full hour and there is nothing that drains me more than a 305 class. I basically think of this as my cardio for the week and if I have to do cardio THIS is the way I'm going to do it! Thanks to Febreze for sponsoring todays post! All thoughts and opinions are my own.